← For the Love of D.I.Y. 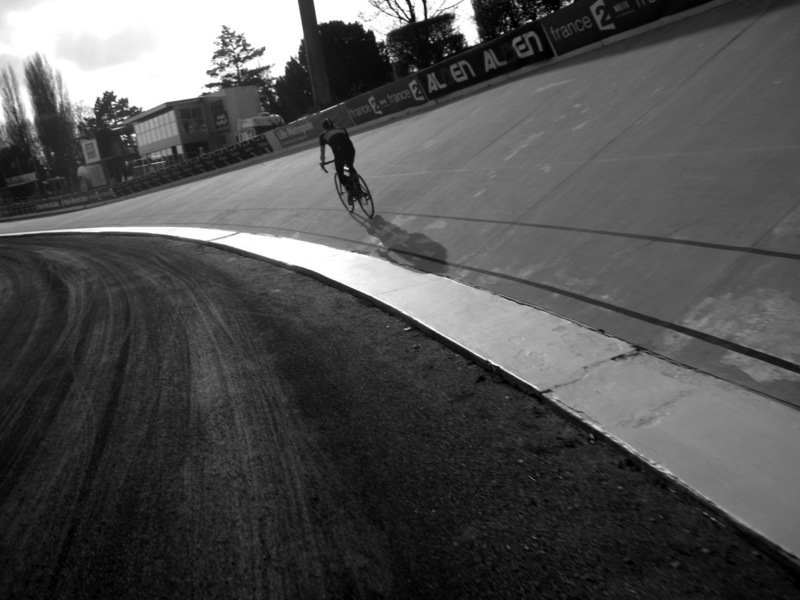 Lucho riding the famed Roubaix velodrome. Lucho, the mystery man behind the blog Cycling Inquisition, is part sardonic, Bike-Snob-esq cultural critic and part Colombian cycling historian. He’s as likely to write about Mario Cipollini’s luscious mane as he is a sincere and in-depth post about Colombia’s first professional cyclists to race in Europe or the difficulties up-and-coming cyclists face in his home country. He was born in Bogotá and lived there until he was 12, which gave him enough time to discover cycling and metal (Lucho also writes for the blog Metal Inquisition) before moving to the United States with his family. Though he chooses anonymity and refused to tell me his real name, Lucho did tell me about his introduction to cycling, the interweaving of violent politics and cycling in Colombia, his work as a an unofficial historian, the evolution of his writing, and more. How did you get introduced to cycling? July 1985 – Lucho Herrera won the dramatic St Etienne stage at the Tour. He arrived to the finish line with his face bathed in blood, due to a crash. Though this may sound odd or silly, that image resonated with the Colombian public. He became a martyr of sorts and a huge national hero. The image resonated with Colombians due in great part to its similarity to the bloody images we were seeing on a daily basis on the news. By the end of that Tour, Herrera won the King Of The Mountains jersey and finished 7th in the general classification (with fellow Colombian Fabio Parra finishing 8th). The entire country celebrated this performance, and thousands lined the highway around the El Dorado Airport to greet the national heroes. November 6-7, 1985 – M-19 guerrillas took over the Palace Of Justice in Bogotá. 55 people were killed, including 11 supreme court justices. The Colombian army attacked the landmark building to get the guerrillas out. The standoff ends when the entire building is burned to the ground.This entire ordeal closed off downtown Bogotá for days and was televised live nationally. The siege further destabilized Colombian politics and was officially deemed a “holocaust and massacre” by the Interamerican Court for Human Rights. November 10, 1985 – Three days after the takeover, Colombian Ephraim Rodriguez set three track cycling world records in Mexico City. All of Colombia celebrated, but still mourned the horrific events of the prior week. November 13, 1985 – The Armero mudslide killed 23,000 and left hundreds of thousands homeless and displaced. There were also clashes with guerrillas, assassinations, large-scale massacres, bombings and kidnappings that we lived through. Also not included are the “cleansings” which took place during that time in cities like Bogotá on an almost monthly basis. “Cleansings” were violent roundups, in which dozens of prostitutes, small-time drug dealers and drug addicts were assassinated. That level of instability was not as apparent in 1984 when I started listening to the Tour with my brother, but similar events happened. This helped all of us become that much more attached to cycling. Early in the mornings, my brother would turn on his alarm clock radio and we would listen to every single minute of every single stage. I would often close my eyes, and picture the racing as it was happening. 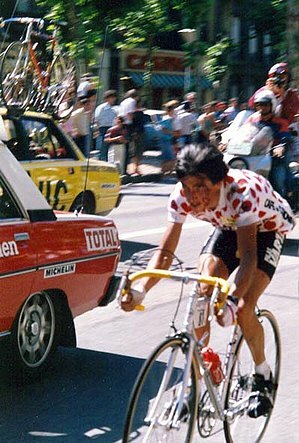 That year (1984), Lucho Herrera won the stage to Alpe d’Huez. I was hooked. I started to ride my purple and black BMX bike around the block, pretending to shift gears with non-existent downtube shifters. I would ride two or three hours each afternoon after the stages were done and I would divide each ride into three or four make-belief stages at the Tour. Some were flat, some were mountainous, and some were time trials. I was a young kid then, but I still think I probably looked nuts riding around the neighborhood in my pseudo aero-tuck position. My favorite riding outfit, by the way, was my blue sweatpants, white Reebok high-tops, and white sweatshirt, which had colorful popcorn screen-printed on it and the word “POP” really big on the front. For years, I obsessed with the sport. I would draw professional cyclists and their bikes, as well as team cars and buses. I could do this for hours after school, and loved every minute of it. Eventually, however, my family moved to the United States. We ended up in a small town in the Midwest. No one around me had ever heard of the sport, even if Greg LeMond would go on to win that year. Cycling wasn’t on TV and the sport had little meaning to me once I found myself outside of the Colombian milieu. I realize now just how emotionally tied to cycling I was as a kid and how much of it was linked to the hardships of the time. Lucho Herrera, the famed Colombian cyclist who this Lucho is often mistaken for. What was it like growing up cycling in Colombia? Were there a lot of other cyclists–racers or otherwise–in Bogotá? Bogotá was a wonderful place to grow up. It was and still is a massive city (about 8 million people or much more depending on how you count). I have very fond memories of my childhood and of the city in general. To be perfectly honest, I’m very unapologetic about my love for Bogotá. The city shaped me and I see so much of it in me. As for cycling, it was a way of life in Bogotá. This is partially out of need, but also because of the love for the sport that has always been there as part of our culture. This is largely true in Bogotá, where we have what may very well be the largest network of bike paths in the world. Most major streets are closed every Sunday from 7 am to 2 pm so that cyclists can ride free of traffic. This has been going on since the late 70s, every single Sunday and every single holiday (Read more about it here). The city also has a car-free day once a year. In a way, the city is so crazy that its citizens see unusual ideas as being rather normal. 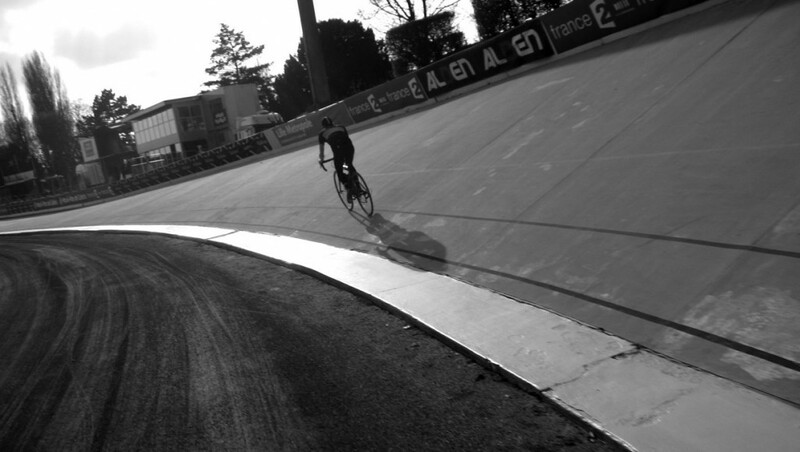 But back to cycling as a sport. You can walk up to almost anyone in Bogotá and strike up a detailed conversation about cycling. Taxi drivers and security guards are amazing sources of information and you can get into heated debates with them about any edition of the Giro or the Vuelta. In general, there’s a love for bikes there that I don’t often see here in the States.I realize this gets into some iffy territory, because it can be very judgmental and dogmatic, but I just see a lot of reverence and attention being paid to the pageantry of cycling here. There’s an attraction to the objects that surround it. The stuff, not the act. And that’s the difference between Colombia and the United States to me. Don’t get me wrong, I like the stuff that surrounds cycling, and surely some in Colombia have a different take on things, but by and large the attraction in Colombia (both by those who ride and those who are fans) runs a bit deeper due to the history of cycling there. The poverty in parts of the country may have something to do with that also. I don’t know. But I do think that people in Colombia are more invested in the emotion that surrounds riding a bike or watching people ride bikes. This is not to say that some American cyclists are wrong or bad. It’s just different. When I started blogging, I did so on a whim. My friend asked me to write for his music blog, along with a few other people. We all picked fairly obscure nom de plums with mine meant as an inside joke with my brother. “Lucho Metales,” was a DJ in Colombia who played speed metal and grindcore music in the late 80s. My brother and I used to listen to his show and laugh for hours about the way he would introduce himself and the songs. He would play the kind of audio special effect tracks that you’ll hear at your local high school haunted house and talk over them about how him and his listeners were once again gathering at the witching hour, as the fog settled… blah, blah, blah. He always struck us as being unintentionally cheesy, so we have always joked about him. I never thought anyone would actually read that blog or that I’d later start a cycling blog. I used the same Blogger account, so the name kinda stuck. This lack of planning is obvious when you consider that I largely write about Colombian cycling and one of the biggest Colombian cyclists of all time was also called Lucho. As a result, I get email intended for him from time to time, from people who want to thank him/me for the great memories of his racing during the 1980s. I’m not hugely secretive, and I do think at some point I’ll start using my real name, if for no other reason than simply because I feel like a gigantic douche bag answering emails addressed to a name that is not my own. 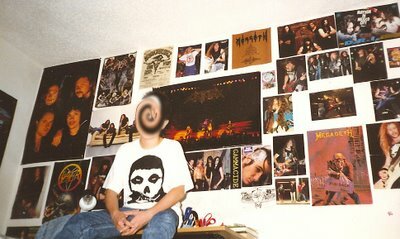 A young Lucho with his shrine to metal. It wasn’t until they came to the U.S. that doctors were able to unswirl his face. Your blog is a pretty amazing historical document about the rise and current state of Colombian professional cycling. I’d imagine that (like it was for me, admittedly) it is the first introduction to the subject for a lot of your readers. Did you want to write a history from the outset or has the writing evolved in that direction over time? As I mentioned before, the whole thing has lacked a real strategy or plan from the beginning. That said, it became clear to me early on that I should write about Colombia within the context of cycling. Although I’m not an absolute expert on the subject, I imagined that many people would have never known these stories unless I wrote them and put them out there. It was around the time that I started to write about Colombian cycling that I noticed that the blog developed a split personality of sorts. This is because, to be honest, I have trouble mocking Colombian cyclists. Call me a lightweight, but I found it hard to laugh at the Colombian mountain bike champion who works as a coal miner under the most horrible conditions and is forced to share a bike with his 10 year old son who also competes. The differences under which Colombian cyclists exist compared to those in Europe and the United States are simply staggering. I try to inject humor, but the level of poverty that pretty much all cyclists in Colombia come from is unheard of here. I think if I were more focused, or if I developed a more cohesive writing style, the blog could be a bit more popular. Be that as it may, I can’t help myself. I just write whatever comes to mind, in whatever tone I deem necessary. On a scale of Kanye West to Bono, how big did your ego get when famed-cycling writer Bill Strickland tweeted that your blog was the one he most looked forward to reading in 2010? Aren’t they on par? That reminds me of people I would meet in the early 90s at death metal shows, who would brag about how open minded they were. They would proudly state, “Man, I will listen to ANYTHING out there from Entombed to Dismember”. For those not familiar with those two bands, they are pretty damn similar. Anyway, as for the tweet, it was nice to see. Now that you mention it … writing a blog seems to largely happen in a vacuum. Aside from the comments people leave or the occasional email, I don’t know what people make of it. So feedback is not a driving force, but I guess it’s good to see what people think. That was very nice of him to say. Am I going to go out and buy some sweet shades in order to look more like Kanye and/or Bono? Am I going to be driven home in a fabulous stretch Hummer limo? Of course. But that has nothing to do with that tweet. As for Bill Strickland enjoying my blog, his great taste in writing has blossomed into a fruitful relationship, which will have me contributing to the cooking section of Bicycling magazine. I have a recipe for vegan turnip turnovers that is to die for. The secret? Paprika of course! This entry was posted in History, Interviews, Racing and tagged bike snob, colombia, colombian cycling history, cycling inquisition, lucho, lucho herrera. Bookmark the permalink. … also, I love this man and his blogs. Sexually.